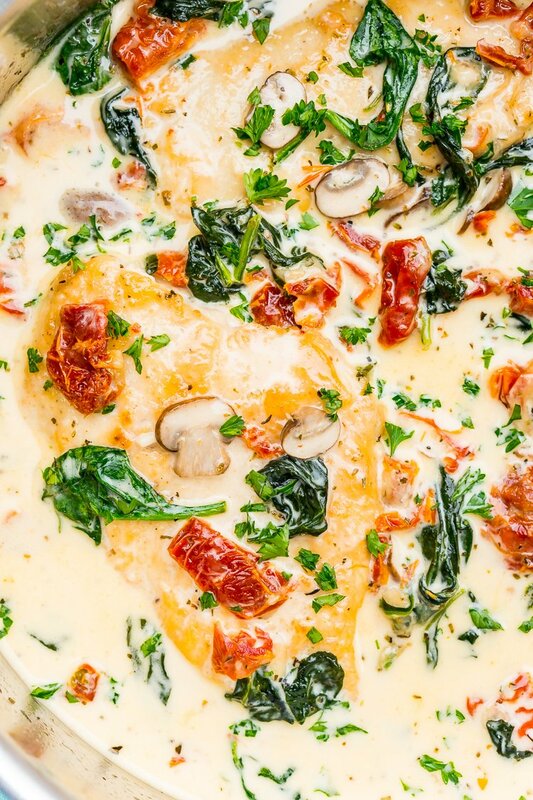 This Creamy Tuscan Chicken recipe is sponsored by Hood® Cream, all opinions are mine alone. 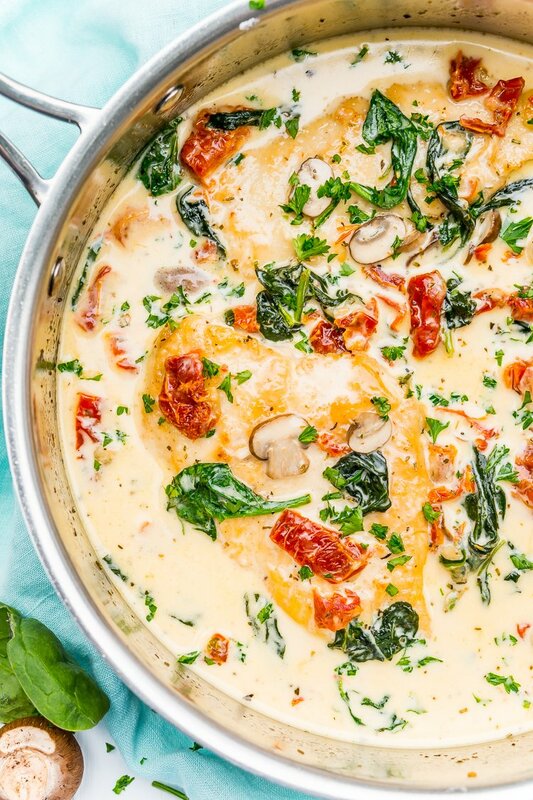 Creamy Tuscan Chicken is a gourmet homemade meal that takes just 30 minutes! 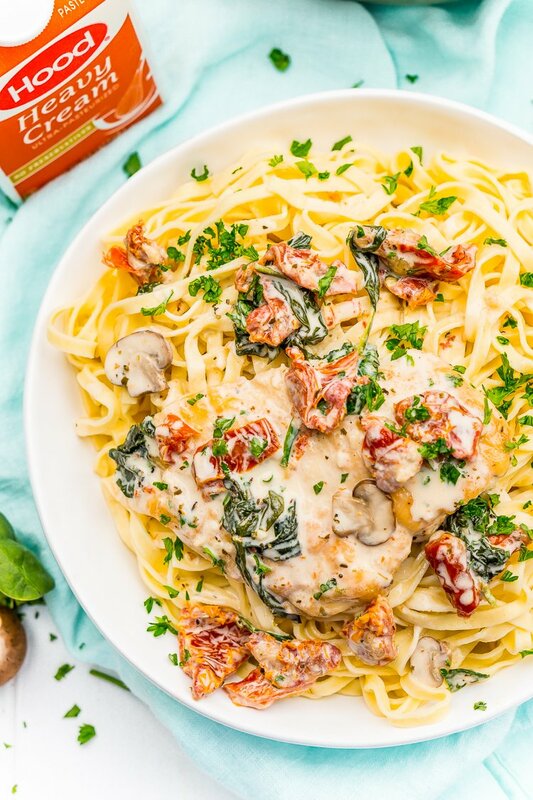 Made with chicken, sundried tomatoes, spinach, mushrooms, spices, cheese, and heavy cream, this is a perfect family-friendly recipe to whip up on any night of the week. It’s no secret that I love making food, but sometimes after a day of recipe testing, the last thing I want to do is cook dinner. That’s why recipes like Creamy Tuscan Chicken come in handy for those busy nights when I want a delicious, satisfying meal without a lot of work! 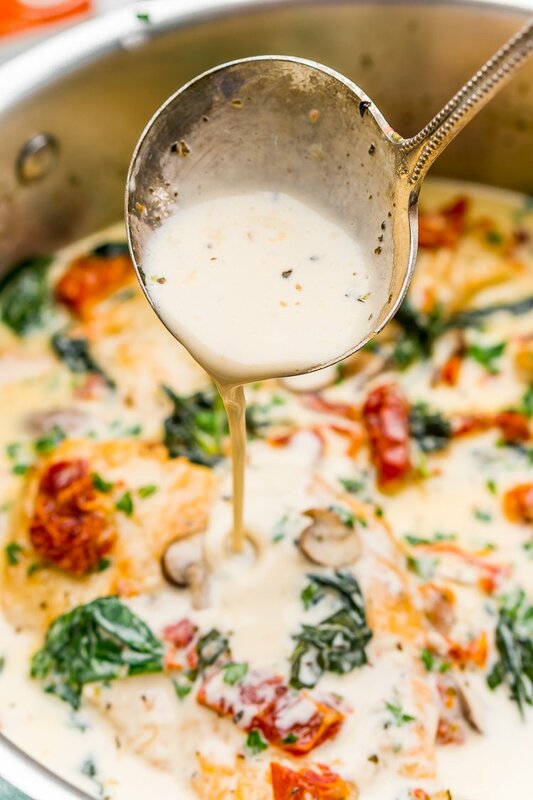 Creamy Tuscan Chicken is a gourmet homemade meal that takes just 30 minutes to make! While it’s beautiful and tasty enough to serve to company, it’s also easy enough to whip up on any weeknight after the family comes home from work or school. JUST TAKE ME TO THE TUSCAN CHICKEN RECIPE ALREADY! 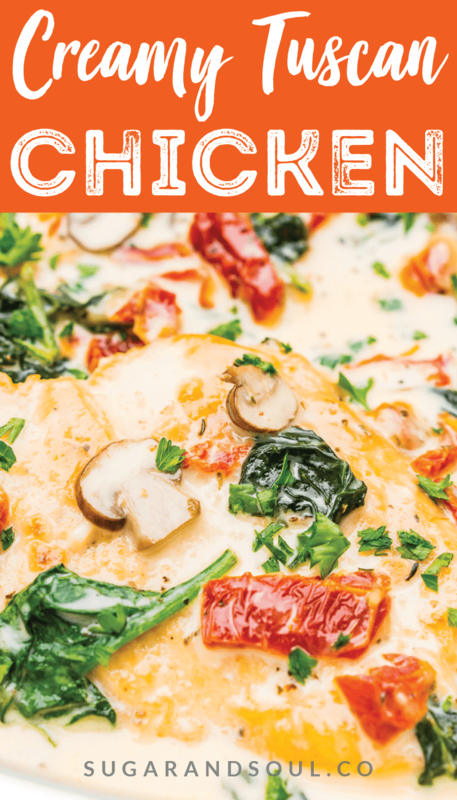 If you’d rather skip my (very helpful, I think) tips and tricks, essential cooking info, and similar recipe ideas – and get straight to this deliciously easy Best Ever TUSCAN CHICKEN Recipe – simply scroll to the bottom of the page where you can find the printable recipe card. This simple recipe is made with chicken cutlets that are seasoned and dredged with flour. 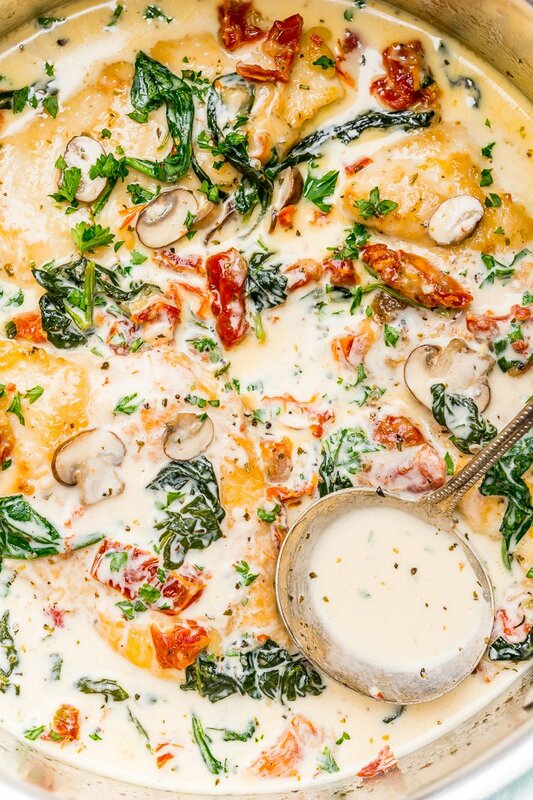 Once cooked, they’re smothered in a rich sauce made with savory ingredients like spinach, sundried tomato, mushrooms, garlic, Asiago cheese, and Italian spices. Now, I’ll let you in on a little secret! To create a truly decadent cream sauce, there’s one ingredient that absolutely can’t be compromised: the cream, of course! For me, the natural choice is to use Hood Cream, a brand that’s trusted by chefs as well as everyday consumers. I’ve used Hood dairy products for years, and as I kid, I remember seeing their jugs and cartons in our fridge! As an adult, I always use a splash of Hood Half & Half in my coffee for a rich, creamy caffeine kick first thing in the morning. When it comes to dairy products (and your morning cup of coffee), you simply can’t skimp on quality! 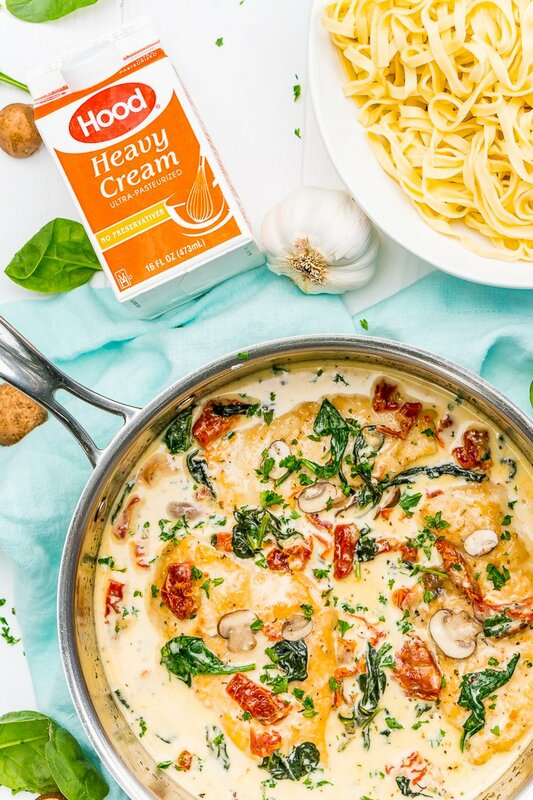 So it should come as no surprise that when I created my Creamy Tuscan Chicken recipe, I automatically reached for Hood Heavy Cream. In my opinion, it’s the key to making the best possible cream sauce. In addition to being a quick and family-friendly meal, Creamy Tuscan Chicken is versatile and can be served a couple of different ways. Naturally, it’s to die for over pasta (the noodles drenched in the cream sauce are so good — I recommend doubling the sauce recipe), or you can lighten it up with a side salad or a scoop of steamed broccoli. As “back to school season” draws near, Creamy Tuscan Chicken is a wonderful recipe to have on hand for an easy and hearty dinner to prepare after a long day. With its rich sauce and zesty flavors, this dish will definitely become a family favorite! 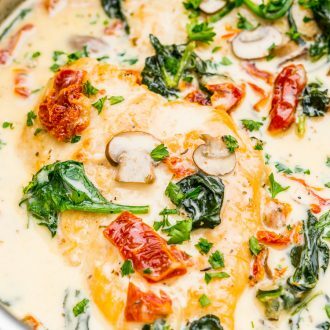 Life is busy, but you can make Creamy Tuscan Chicken for a gourmet 30-minute meal any night of the week. 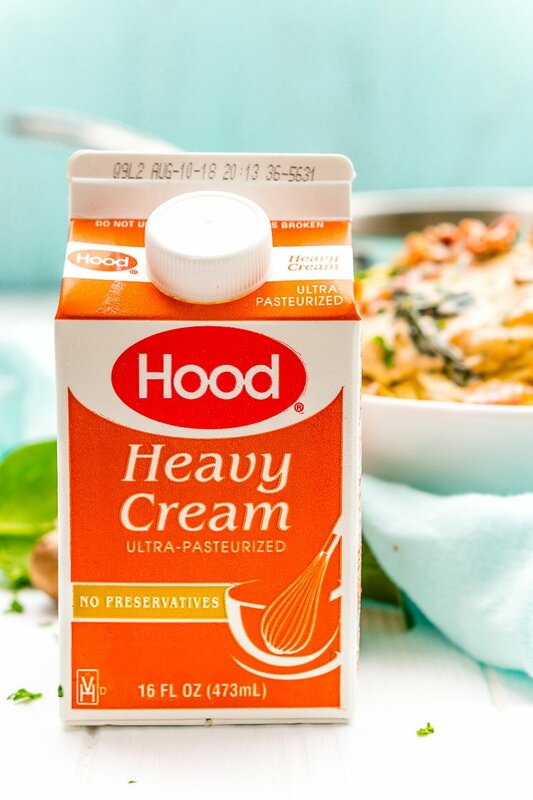 Made with quality ingredients like Hood Heavy Cream, this mouthwatering recipe is simple, wholesome, and totally delicious! Find more great recipe inspiration and coupons on the Hood Cream website and don’t forget to follow them on Facebook, Instagram, Twitter, and Pinterest. And try these other great recipes made with Hood Cream! Slice the chicken breasts in half to create 4 thin cutlets. Rub the chicken on both sides with the salt, pepper, and garlic powder. Spread the flour out on a medium plate and coat each of the chicken cutlets with flour. Add the olive oil to a large skillet and heat over medium heat. Add the chicken to the skillet and cook each side for 3 to 5 minutes until golden brown and an internal temperature of 165 degrees F is reached, transfer the chicken to a plate. Add the garlic and chicken broth to the pan and use a wooden spatula to scrape and deglaze the bottom of the pan, allow the broth to come to a simmer. Add in the Hood Heavy Cream, salt, pepper, Italian seasonings, and asiago cheese. Stir frequently until the cheese has melted. Bring the creamy mixture to a simmer, stirring frequently. Add in the vegetables and continue to stir until sauce begins to thicken and the spinach begins to wilt. Add the chicken back into the pan and cook for another 1 to 2 minutes. Serve by itself with a salad or with pasta*, garnish with parsley and add Parmesan cheese and additional salt and pepper to taste. If serving with pasta, I recommend doubling the sauce recipe. I use fresh sun-dried tomatoes, not the jarred kind. You can use the jarred kind, but I recommend draining and patting with a paper towel before adding to the sauce. Recipe adapted from Salt & Lavender. This was a HIT with my entire family! Even with the kids who ‘don’t eat anything green’. This is going in our menu rotation, for sure! Delicious! Turned out delicious… My boyfriend loved it. I only substituted the sun dried tomato with cherry tomatoes which, I sliced in halve. I’m so glad you enjoyed it and it turned out great with fresh tomatoes too! Wonderful dish! I just finished making/eating it and will make this again – definitely! Easy to make, too! OMG this is sooooo delicious. I will be definitely making this again and again. Thanks for sharing. I’m so glad you enjoyed it, Maurita! As someone who does not have a lot of experience cooking, I was suprised by how simple yet excellent this dish came out! I will be making it again and again. Thank you for sharing!